Also included is an frsky D4R-ii transmitter (with cable and pin jumper). This tiny FrSky 2.4GHz diversity receiver, weighing in at just 1.6g, is perfect for racers looking to lower their all up weight. CONSISTS OF THE EXCELLENT FRSKY DJT MODULE AND TWO OF THE FRSKY V8FR EIGHT CHANNEL RECEIVERS. The R9M mini 868MHz receiver long range receiver from FrSky. This tiny receiver brings all the features of previous R9 receivers in a compact and lightweight design. Super low latency, and it supports the redundancy function to ensure your aircrafts safety. Frsky RC Long Range R9M Module And R9 Mini Receiver LBT Combo. Condition is New. UK Dispatched with Royal Mail Signed For® 2nd Class. Will post to Europe. Frsky XM Micro / Nano D16 SBUS Full Range Receiver Up to 16CH. Frsky XM Micro D16 SBUS Full Range Receiver Up to 16CH. This insanely tiny 2.4GHz diversity receiver from FRSKY is the next big thing in miniaturization of racing craft. This item is used to allocate/set the channel number for FrSKY SBUS and CPPM compatible servos e.g. D12MB and also Futaba SBUS servos. It is compatible with the FrSky SBUS Decoder. Weight: 6.7g. The FrSky R9 Slim receiver is the updated version of R9 Slim, with optimized performance and 2 detachable antennas. 868MHz(EU Version). 1 x R9 Slim Plus. You are buying the EU Spec version. Small and conveniently setup. This tiny FrSky 2.4GHz receiver, weighing in at only 1g, is perfect for racers/freestylers looking to lower their all up weight. Compatibility: FrSky D16 mode. Number of Channels: Up to 16CH from SBUS(CH1~CH15 for PWM,CH16 RSSI for FC). FrSky X4RSB 3/16 Channel Telemetry Receiver for RC Drone FPV Racing, UK! Compatibility: FrSky X-series Module (XJT etc.) Taranis X9D in D16 mode(X4RS B is not work with D-series Module). S B port is compatible with Futaba S.BUS servos and FrSky S BUS&CPPM compatible servo. 5 out of 5 stars - FrSky X4RSB 3/16 Channel Telemetry Receiver for RC Drone FPV Racing, UK! 4 product ratings4 product ratings - FrSky X4RSB 3/16 Channel Telemetry Receiver for RC Drone FPV Racing, UK! *** EXTRA SILICON WIRE FOR EASY SOLDERING *** FrSky's XSR 2.4GHz receiver features 16ch ACCST, with S-Bus and CPPM. This little guy is physically smaller and lighter weight than the X4R receiver. Making it great for mini race quads! Features : Smart Port enabled, realizing two-way full duplex transmission S-BUS output, CPPM output Lighter weight and physically smaller than X4R More number of channels 1-16ch from SBUS channel, 1-8ch from CPPM channel Specs : Compatibility: FrSky X-series Module, X9D, X9DP, X9E, X12S in D16 mode (XSR is incompatible with D-series Module) Dimension: 26 x 19.2 x 5 mm Weight: 3.8g Operating Voltage Range: 4.0~10V Operating Current: 100mA@5V Firmware Upgradeable. 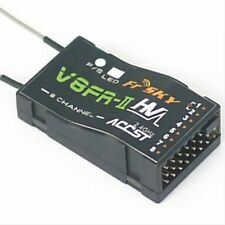 FrSky V8FR-II 2.4G 8CH Receiver HV Version. 1 x FrSky V8FR-II receiver(HV Version). Number of channels: 8. Extended range (1.5km-2.5km). Range: 1.5km-2.5km. Precise and smooth servo response. We will try our best to reduce the risk of the custom duties. Frsky XM Micro D16 SBUS Full Range Receiver. – Compatibility: FrSky D16 mode. – Number of Channels: Up to 16CH from SBUS (1-15ch for PWM,16ch RSSI for FC). This insanely tiny 2.4GHz diversity receiver available from TBS is the next big thing in miniaturization of racing craft. 1x FrSky XSR 2.4GHz 16CH ACCST SBus CPPM Receiver. Switchable SBUS/ CPPM signal output. Number of channels : 16CH (1-16CH from SBUS channel, 1-8CH from CPPM channel). The FrSky ultra mini receiver R-XSR is the evolution of the popular full range XSR receiver. Condition is as new, used twice. This is the smallest and lightest receiver from FrSky that has 16 channels through SBUS. Works with FrSky Taranis X9D Plus Transmitter. 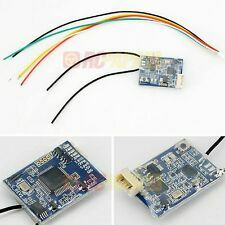 FrSky XM 16ch Micro Receiver RX SBUS Full Range. FrSky XM & XM Plus: Flashing Firmware (EU/Non-EU/LBT/FCC). The X6R is smaller than previous FrSKY 6-channel receivers, but provides 16 channels as well as the new Smart Port, that supports the new range of hubless digital sensors, into one small box! The new antennas on the X6R which FrSKY refers to as PCB antennas report up to a 20% range increase over the standard antennas. This receiver results from a collaboration between FrSKY and Eachine. Compatibility FrSky X-series Module & radios in D16 mode. Number of Channels 16Ch (1~16ch from SBUS channel, 1~8ch from CPPM channel). Type: TFR4. This receiver is one of a range of 2.4GHz FASST compatible receivers designed and developed by FrSKY. These receivers are not copies of the original receivers but are compatible with, and work with Futaba FASST (Futaba Advanced Spread Spektrum Technology) aircraft transmitters. Compatible with the Taranis Q X7, Taranis X9D, Taranis X9D Plus, Taranis X9D Plus SE, Horus X12S, and Taranis X9E. FrSky XSR-M Micro 8 Channel CPPM / SBUS Receiver. • Supports 16 channels SBUS or 8 channels CPPM. 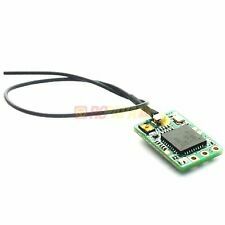 FrSky XM - Ultra Light Sbus Receiver Up To 16CH With EU LBT Firmware. This insanely tiny 2.4GHz receiver available from FRSKY is the next big thing in miniaturisation of racing craft. Compatibility: FrSky D16 mode. A LiPo flight battery. Model: D8R. Easy to bind and has instant link-up between transmitter and receiver. Modulation: ACCST (Advanced Continuous Channel Shifting Technology). Failsafe on all channels. FD800 Tiny FrSky 8 Channel Drone SBUS Receiver. 1x 1 x FD800 Tiny FrSky receiver. Designed to be used with any tiny micro racing drone and compatible with the FrSky Taranis X9D this is a minuscule masterpiece. It features up to 4 regular PWM outputs. Smart Port enabled - this feature is a signal wire, full-duplex, digital transmission interface developed by FrSKY Electronic Co Ltd. All products enabled with Smart Port including: the XJT module, the X4R receiver, new hub-less sensors, new Smart Dashboard, etc., serial port user data and other user input/output devices can be connected without limitations for numbers or sequences at a high transmission speed. FD800 Tiny FrSky 8 Channel Drone PPM Receiver. 1x 1 x FD800 Tiny FrSky PPM receiver. Designed to be used with any tiny micro racing drone and compatible with the FrSky Taranis X9D this is a minuscule masterpiece. FrSky VD5M 2.4Ghz 5CH Micro Receiver. Super small & light weight, the FrSky VD5M is a perfect choice for park flyers and indoor models. IWeighing 0nly 2 grams! FrSKY ACCST technology is proven, approved by many model associations, tested and reviewed as the leading Chinese 2.4Ghz R/C Technology. FrSKY ACCST technology is proven, approved by many model associations, tested and reviewed as the leading Chinese 2.4Ghz R/C Technology. If you think DSM2 or FASST is the best, think again! FrSKY ACCST (Advanced Continuous Channel Shifting Technology) gives you secure radio communicatios in 2.4Ghz band. Easy to bind and has instant link-up between transmitter and receiver. Connecting channels 3 and 4 using one of the supplied jumpers will output RSSI (PWM) output on channel 1 and CPPM for CH1~CH8 on channel 2. The RX4R is a standalone receiver with all the functions of X4R, it features 4 PWM outputs with high precision and low latency. The PWM output latency is 9ms less than that of the X4R in high speed mode. The new upgraded RX8R Pro is based on the RX8R receiver. It’s deviation of PWM is reduced to 0.5us, and the delay of PWM output is 9ms less than that of the X8R in high speed mode. And a new feature to decrease the affect of interference caused by the ignition process. This is the FrSky R9 868mhz Long Range Receiver with Smart Port for use with the R9M transmitter module. This receiver is part of the first long range setup which operates in the recently relaxed 900MHz band (868MHz in the EU). FrSky XMR Mini Receiver with EU-LBT Firmware. FrSky XMR Mini Receiver with EU-LBT Firmware. The FrSky XMR Mini Receiver is just 0.8g and is an excellent 6 channel receiver for small fixed-wing indoor and park flyers. Number of Channels: X4RSB- 3/16Ch (9~10ch from conventional channel outputs, 1~16ch from SBUS channel,1~8ch from CPPM Channel). Number of channels: X4RSB, 9~10ch from conventional channel outputs, 1~16ch from SBUS channel, 1~8ch from CPPM Channel. The X8R is smaller than previous FrSKY 8-channel recievers, but provides 16 channels as well as the new Smart Port, that supports the new range of hubless digital sensors, into one small box! The new antennas on the X8R which FrSKY refers to as PCB antennas report up to a 20% range increase over the standard antennas. FrSKY's R9 receiver needs to be used in conjunction with FrSKY's R9M module. 868MHz EU working mode. Longer range than L9R.